Walk through design creates unobstructed entry and exit. Seat back lumbar wings and head rest increase the user’s comfort and enhances the premium aesthetics. Properly aligned pressing plate and user support prevent over rotation of the hips during the exercise. 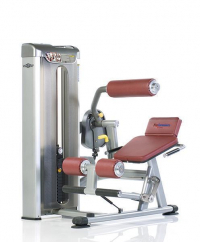 No adjustment shin stabilizing pad streamlines the operation of the machine and reduces unnecessary wear parts. Seat back lumbar wings and head rest increase the users comfort and enhances the premium aesthetics. Easy adjustment to change exercises from the seated position. Angled seat properly aligned with the mid row pulley creates an unobstructed path for the rowing exercise. Two rail handle holder prevents rowing handle from coming undocked and strengthens the frame. Polished and knurled aluminum foot rest creates a no wear surface and enhances the premium aesthetics. Effortless one handed gas assisted adjustment allows for quick and easy transitions between chest, incline and shoulder press exercises. 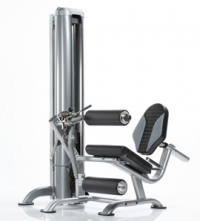 Multiple grip positions add variety and user comfort to each exercise. 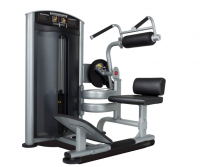 Weight cables are hidden inside the frame for safety and durability. Seat back lumbar wings and head rest increase the users comfort and enhances the premium aesthetics. 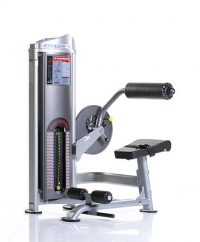 Oversized hand pads provide added comfort for tricep press exercise. Rear seat pad for added stabilization during tricep exercise. Multiple starting positions for both exercises. Overhead grips and a rolling back pad prestretch the abdominals and creates a traditional crunch exercise. 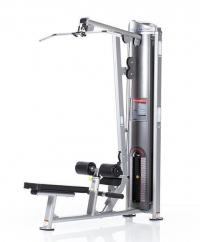 Unlike other ab/back machines there is no need to exit the machine to change exercises. Minimal adjustments creates ease of use and long term durability. 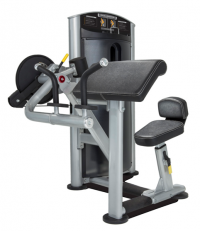 The oversized seat and rounded lumbar pad increase user comfort. Counter-balanced pivot arm with multiple start position adjustments. Unique hydraulic assist foot support with easy access adjustment handle to accommodate various leg lengths.